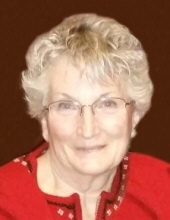 Sheri Conlan, 68, of Cresco, Iowa passed away on Tuesday, December 4, 2018 at the Evans Memorial Home in Cresco, Iowa surrounded by her family. Sheri was born on August 13, 1950 in Cresco, Iowa to Joseph and Imogene Schemmel. She was actively involved helping on the farm when growing up. She attended Notre Dame School and graduated in 1968. Following high school she moved to Minneapolis and worked many years for the University of Minnesota. While living in Minneapolis, she met Mike Conlan and married him in 1974. Together they moved to Cresco, Iowa where they came to start and raise their family. She stayed home to care for her children until it was time for them to start school. It was then Sheri went back to work outside of the home. She worked for 22 years in the Superintendent's office. Following her time there, she volunteered for a number of years at the Notre Dame Elementary School. She later pursued her most beloved job of being a Grandma. She was a tremendous baker and a creative seamstress. She enjoyed making countless things with and for her grandchildren. She cherished all of her time with her grandchildren. She was diagnosed with Glioblastoma Multiforme Brain Cancer on February 14, 2018. Her battle came to an end after 9 1/2 months. She is survived by her husband Mike, her three children; Pat (Grethe), Regan (Jon), and Ryan (Kelli), her four grandchildren; Leah, Kalani, Aviana, and Dublin. In lieu of flowers, please consider a donation to a local charity or a project of your choice. To send flowers or a remembrance gift to the family of Sheri Conlan, please visit our Tribute Store. "Email Address" would like to share the life celebration of Sheri Conlan. Click on the "link" to go to share a favorite memory or leave a condolence message for the family.